I’ll update to the RC then, thank you. I am running v3.10.0-dev on a Matek F405-wing and I don’t have the options listed for RC[number]_OPTION. Setting it to “41” enabled me to set an arm/disarm switch, but I am wondering why the list of options isn’t listed. Does anyone know why that might be? Also, bonus question, the switch I have used is a 3 position switch. I would like to have the FC armed in either the centre or down position and disarmed when up. Currently it will only arm when down and only disarm when up. (i.e moving the switch to the centre position the FC is still disarmed. Once in the down position the FC becomes armed and moving the switch back to centre it stays armed. Only moving it to the up position does it disarm.) This must be a setting somewhere but I haven’t been able to figure it out. Update Mission Planner to Beta maybe? I’m sure that’s what I was running when I posted that screen shot. The switch action would be a radio mix function to do what you want. Thanks, I didn’t realise this is the copter forum. I am using plane. I have flashed 3.9.2 (which is what I intended to flash and not 3.10.0-dev, I’m new to ardupilot), now the RC[number]_OPTION has disappeared altogether. It must be one of the differences between copter/plane?? I am now back to the drawing board with an arm/disarm on a switch. Sure it has. Flash back to the dev version and its there in Arduplane. arm/disarm switch, but I am wondering why the list of options isn’t listed. Does anyone know why that might be? setting somewhere but I haven’t been able to figure it out. Can you fix it on the transmitter? Thinking about it after my post, I’m presuming that the arm/disarm setting is either high or low so I suspect that I could fix it by using a curve but I haven’t had the chance to try it out the last day or two. It works, that’s the main thing for me at the moment! 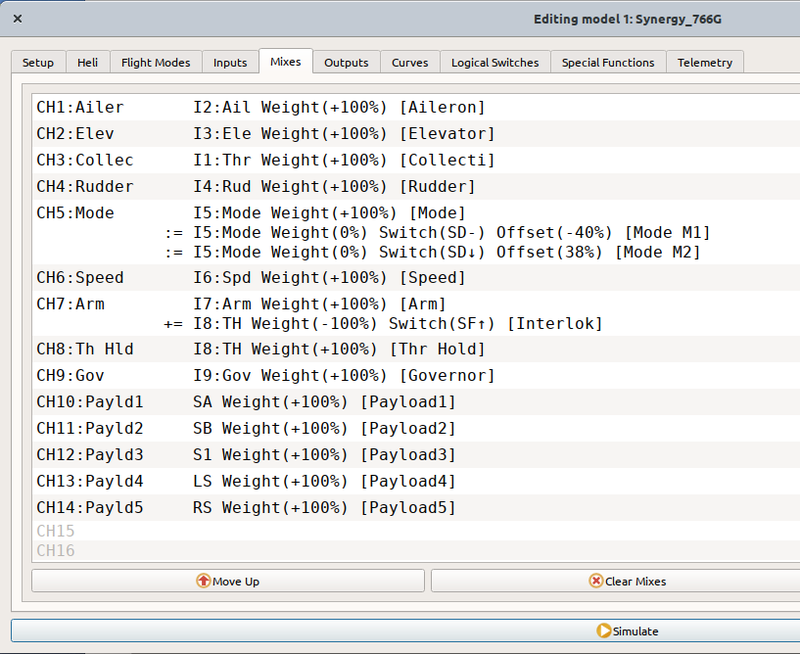 I just realized that switch arming was added to Arducopter but have not had a chance to play with it. Is it possible to setup the switch arming as Josh Bardwell in this video (https://www.youtube.com/watch?v=bv3VJ1jznw8). I have used this method on my betaflight quads for quite a while and prefer it to stick arming. I use a Taranis X9D+ running OpenTX 2.2.2, and Arducopter 3.6. Sure it will work. After configuring a Arm/Disarm channel function CHx_OPTION to Arm/Disarm (41) you can activate it however you like. This method will work but it will immediately disarm if the switch is bumped. So safety on the Arming side but a potential “rapid return to earth” function on the other. Note: This function Arms with PWM>~1800 and Disarms <~1200 so take that into account when you set up your switch mixing. I use it exclusively on helicopters, since stick arming/disarming will cause those to go into dynamic rollover on the ground if you try to disarm with the main rotor turning. I have a mix in my Taranis X9D+ between the throttle hold and arming switch, so both have to be thrown before it will disarm. While multicopters don’t have a throttle hold, a mix could be set up similar to helicopters so it requires two switches on opposite sides of the radio to disarm. Unlike multicopters, helicopters can disarm in flight and they still fly fine in autorotation in one of the manual flight modes. So an arming switch + interlock switch for multicopters probably wouldn’t be a bad idea if there’s chance of accidentally hitting the arming switch in flight. Yes, I suppose you could use logic similar to this Arm delay on disarm and rather than immediate disarm with one switch only it would require the momentary also with some delay. Just a thought. I just had another thought. You could use one of the S pots for arm/disarm. Not likely to accidentally turn those! The throttle limit could still be used for arming. Chris, would you mind showing some images of how you set yours up on the helicopters? This is the detail of the mixes in OpenTx between the arming switch (Channel 7) and the Throttle Hold switch (Channel 8). The arming switch is on the RF of the radio, the throttle hold switch is on the LF. Channel 9 is also throttle control, but that’s for the engine governor and it has no weighting on the mix between 7 & 8. Where you don’t have an actual use for a throttle hold you could just assign a switch to do the mix instead like I did with Switch D for flight modes. The way this works is that the arming switch (channel 7) has to go high before the system will arm. But once throttle hold is released for flight idle power, turning the arming switch off (to disarm) has no effect. I can flip throttle hold from flight idle to ground idle power at any time. But they both must be off to disarm. We should have the option to just ARM/DisArm with a switch, the motor interlock works, but it’s not convenient, stick arming for 2 seconds, then unlock the motors, can’t we just chose which style fits our craft the best? You can arm with a switch if you want to try AC 3.7-dev. Just set an RcX_OPTION to the channel of choice. I am using a PHL FC, where do I find that version of FW? but they are not labeled at all what version they are, just some dates, beta, latest, stable, etc, tia! Latest is 3.7-dev. Be warned: it’s not a stable release. Results may vary. Thanks, where do I get it?